My daughters thrive on this snack. It seems so simple, but getting a protein rich snack is difficult for gluten free people. Getting a simple, protein-rich, organic snack? You have to make it yourself. combining organic ground beef, organic brown sugar, organic ginger and garlic with just a bit of organic gluten free tamari sauce makes for a lovely Asian influenced flavor. This is my go to recipe for travel. Having the right dehydrator and jerky gun makes it so easy to do. Just mix, pipe and dehydrate overnight. If you prefer spicier jerky feel free to add ½ teaspoon or more of cayenne pepper in the mixture or pipe it out and sprinkle with coarsely ground black pepper before dehydrating. Dehydrate at 160 degrees for at least 7 hours or till well dried and leathery. You will need to have a good dehydrator that goes up as high as 160 degrees for this recipe. Otherwise, there is a chance of bacterial growth in the finished beef jerky. 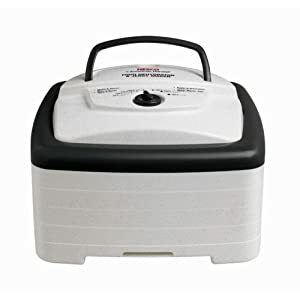 The one I use is this Nesco/American Harvest FD-80 Square-Shaped Dehydrator. It ranges from 120-160 degrees and can handle 3 pounds of jerky if you buy the additional screens. I love that I can dehydrates herbs and fruits as well. Since I’m using ground beef instead of sliced meat, the next tool needed is a forming tool. 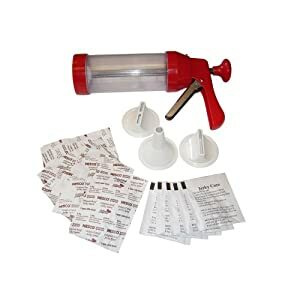 This Jerky Gun Kit allows you to make the finished jerky into thin strips, wide strips or round sticks just by changing out the plate. The ratchet feed is similar to a caulking gun, so simple to control. It ‘s easy to clean too since the machine comes apart into individual pieces. Don’t use the initial seasoning mixes they send with it though, I have no idea whether or not those are gluten free.